Good Morning, Good Afternoon, Goodnight, what have you done with your life? I would like to say that it is with heavy heart that I once again take up the fountain pen of my mind; I'd like to say that because it seems like an appropriately literary beginning to this sad story but it simply isn't true. It is with a peaceful and balanced heart and pensive mind that I return from my desert wanderings to the Tao. I say "sad story" but of course the opposite is also equally true - there is no one without the other and this is The Tao of Teaching. One area that has hit rather a lull in proceedings also happens to be the reason that I am here in Mexico; it also happens to be the reason I am writing this today. I speak, of course, of teaching. Times have been difficult at the school and to be honest there has been such a flurry of activity outside of the classroom that events inside have taken second place, until the last couple of weeks that is, when things have been brought back into sharp focus. 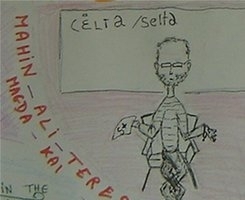 I received an e-mail from one of my classmates from the CELTA course I took to become a certified teacher. She is currently working in the same school in which we studied, and her correspondence brought with it the sad news that one of our tutors, Simon Dix, was very sick and had been admitted to a hospice. I thought back to the fun we had and the lessons we learned in that Oxford classroom a lifetime ago; in fact I regularly think of Simon and the one lesson for which I was awarded an "S+" for adapting well to an unexpected situation (in a later essay I was to quote Bruce Lee: "be like water" - a philosophy that continues to serve me well). I think now of the hospice, a place of peace, an end to the surgeries and treatments, a place where every breath is sweet because it may be one's last. No different of course to each and every one of us although we sometimes forget this as we go about our daily lives. I think of Simon's travels and how far his influence stretches and I put these two things together. Energy cannot be created or destroyed. Every single action we make effects the whole world, every word we utter, every thought - so make them positive, use them to build, for whether tomorrow or the next life shall come first we can never know. Simon passed away last Friday. I cannot claim to have known Simon very well at all; it was a mere month in which I was taught to teach but that month has had a profound effect on my life and I know that he will be sadly missed. I am cheered, however, by the thought of his many, many students spread throughout the wide world to live and share the gifts that he gave - the English that opens up a new world of communication, understanding and friendship for so many people; the love of language; and the joy of new places and faces and cultures, hopes and dreams, lives and loves, and teaching. I say thank you, to a man who taught me to teach. Home tutions: I like these articles to read so try to send me more articles to me. i am ready to give 99% ratings to your articles. You are one of the blessed ones if you were able to meet someone that changed your life even for a short period of time. A person like the ones from the story from college paper writers who will teach you something that will have a great impact in your life.